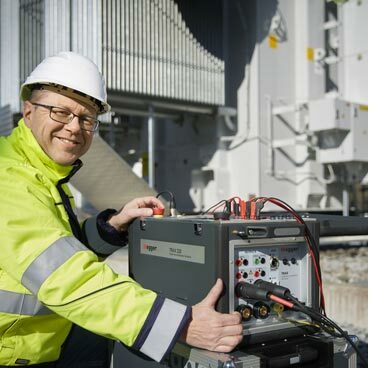 Optimised for transformer and general substation testing, TRAX test systems are capable of performing more than 20 different test functions including, for example, measurement of winding resistance, turns ratio, excitation current, short-circuit impedance, tan delta and capacitance, and frequency response of stray losses, as well as CT and VT testing and circuit breaker timing and motion analysis. The test systems allow a wide range of currents and voltages to be generated and measured with high precision. The TRAX220 has a maximum AC current output capability of 200 A, while the TRAX280 extends this to 800 A. For both units this can be extended to 2000 A with an optional current booster. Users have a choice of full manual control or guided testing using the built-in TRAX “apps”. Other key features of Megger’s new and innovative TRAX test sets include state of the art transformer winding resistance measurements, with test currents up to 100 A true DC at up to 50 V compliance voltage; dynamic on-load tap changer (OLTC) measurements; exceptional interference suppression to secure accurate readings even in high noise switchyards; a wide operating frequency range of 5 to 500 Hz (1 to 500 Hz for tan delta measurements); individual temperature correction of tan delta measurements using Megger’s patented technology; and automatic voltage dependence detection, which is another unique feature covered by Megger patents. To ensure maximum operator safety, all TRAX test sets incorporate ground-loop detection, dual interlocks and facilities for fast discharge of inductive measurement objects. Provision is also made for connecting an optional strobe warning light. The Megger TRAX family of multifunction transformer and substation test sets currently includes three models. The TRAX220, with 200 A output capability and the TRAX280, with 800 A output capability have integral colour touchscreens for the user interface and to display test results. The TRAX219 has capabilities similar to those of the TRAX220, but has no touchscreen and is designed to work in conjunction with an external computer. Options available for use with TRAX test sets include the TDX120 unit for tan delta and capacitance measurements, the TSX130 unit for three-phase measurements on transformers, and the TCX200 unit for high-current testing up to 2000 A.
Používáme soubory cookies pro lepší uživatelský komfort. Přečtěte si vice na Informace o cookies.